In a food processor, process almonds & Cornflakes for 1-2 minutes to a chunky bread crumb consistency. Set aside. Dip chicken into a bowl containing the beaten egg, followed by dipping the chicken into the almond & Cornflake mixture. Coat each chicken breast with almond & Cornflake crumbs on each side. Place is a baking tray in oven and bake chicken for 7 to 10 minutes. 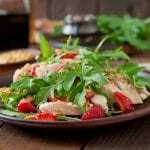 Plate up Chicken – in slices with Side salad of Wild Rocket & Freshly sliced Peppered strawberries and splash salad dressing on Wild Rocket and finally drizzle Strawberry Glaze over the chicken.